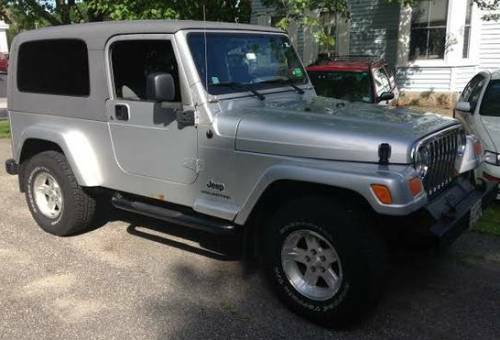 Message: For sale is a 2005 Jeep Wrangler Unlimited. Many of the common repairs done 1,300 miles ago. Recently this Jeep had a new cylinder head placed, push rods, all new gaskets, water pump, and coolant temp sensor. It ran really well considering it needed new valve seats, and now it runs fantastic. Approx. 1 year ago complete brake job done including new emergency break. BF Goodrich Rugged Terrain tires placed winter 2013, rotated every 6000 miles and show very little wear. Oil changed every 3000-4500 miles. U joints done at approx 140000, alignments done routinely. I have personally owned this Jeep since 2010 when it had 109000 miles and it has not been on off road since then. Appears to have 2 inch lift kit placed before I purchased it. Soft top and hard top, hard top currently on. A/C works great! As for the body, I recently replaced the front bumper and the side steps. There are two rust spots, one the driver side fender, and one just under the passenger side door. Thank you for looking, call.text.email. with questions, no trades please. This entry was posted on Monday, July 7th, 2014 at 9:24 pm	and is filed under Maine, United States. You can follow any responses to this entry through the RSS 2.0 feed. Both comments and pings are currently closed.